Background: Dynamic contrast-enhanced computed tomography (DCE-CT) is a promising non-invasive method that provides the functional evaluation of the vascularity in normal and malignant tissue. 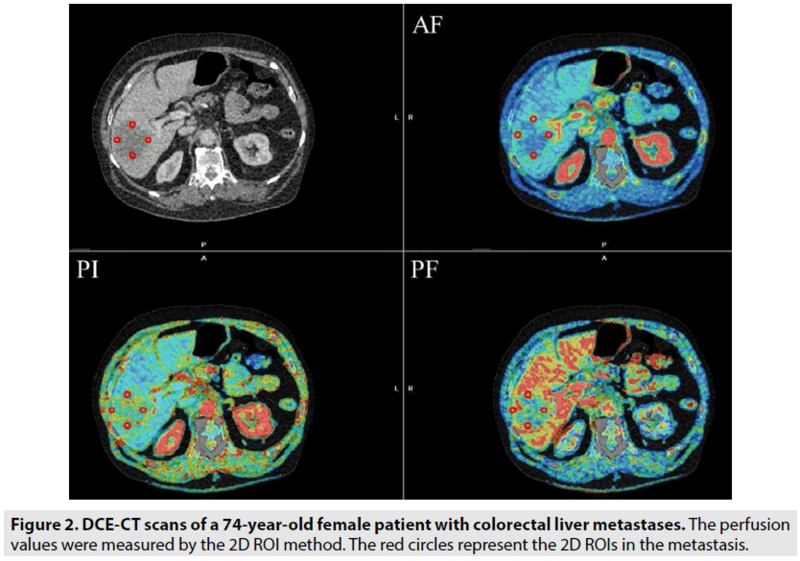 The objectives of this consecutive study were to investigate the possible correlation between the perfusion characteristics of colorectal cancer liver metastases as examined by (DCE-CT) and the microvessel density of resected metastases. An additional aim was to investigate the correlation between the urokinase plasminogen activation receptor (uPAR) and perfusion values. Methods and findings: Eleven patients fulfilled the criteria for comparative analyses. The microvessel density values,uPAR level and the DCE-CT values were analysed. A perfusion index (PI) based on the measurement of arterial and portal flow (AF, PF) was defined as follows: PI=AF/ (AF+PF)%. The DCE-CT measurements were compared between metastatic and normal liver tissues. A Spearman correlation test was used for statistical analysis. The perfusion index and microvessel density values were significantly correlated (r=0.75; p=0.01). Furthermore, a higher volume of metastases significantly correlated with higher plasma levels of the uPAR forms (0.72 ≤ r ≥ 0.89; p < 0.05). AF: Arterial Flow; CLM: Colorectal Liver Metastases; DCE-CT: Dynamic Contrast-Enhanced imaging with Computed Tomography; MVD: Micro Vessel Density; PF: Portal Flow; PI: Perfusion Index; RECIST: Response Evaluation Criteria in Solid Tumours; uPAR: urokinase Plasminogen Activator Receptor; 2D ROI: two-dimensional Region of Interest; 3D VOI: three-dimensional Volume of Interest. Advanced colorectal cancer shows a poor prognosis, and more than 50% of patients develop metastases, most frequently in the liver, during their disease course [1,2]. Angiogenesis, which is important in the growth and metastasis of carcinomas, appears to be a promising prognostic marker for colorectal cancer and microvessel density count is used to define the number of angiogenic blood vessels in tumours, where the vessel density is quantified by microscopy or digital pathology [3-5]. Studies have shown that the microvessel density can be used as a predictor of prognosis in colorectal liver metastases [4,6], and in a study by Eefsen et al. the results showed a lower level of microvessel density in patients with colorectal liver metastases who were treated with chemotherapy. The urokinase plasminogen activator receptor (uPAR) is a protein of the plasminogen family, which is up regulated in several tumours [7-9] and seems to play a role in angiogenesis [10-13]. Conventional CT scans are currently the most commonly used imaging modality for monitoring malignant tissue using the RECIST criteria (response evaluation criteria in solid tumours) . However, dynamic contrastenhanced - CT is a relatively new technology that allows measurement of tumour vascularity and the method can easily be integrated into routine CT imaging protocols, within the same session . Thus, DCE-CT may provide qualitative and quantitative information on perfusion patterns in metastatic tumour tissue, with the potential to serve as a tool for monitoring therapy-induced changes in various types of lesions . Two studies showed a significant correlation between DCE-CT and microvessel density values in patients with colorectal liver metastases [16,17]. Studies evaluating the correlation between the DCE-CT values and the plasma uPAR forms have not yet been described but two studies have shown that a high urokinase plasminogen activator receptor correlates to a poor prognosis [18,19]. Therefore, the aim of this study was to investigate the possible correlation between DCE-CT and microvessel density in patients with colorectal liver metastases as well as the possible correlation between different uPAR forms in the plasma and DCE-CT values. Twenty-eight consecutive patients with histologically confirmed colorectal liver metastases, who had not received chemotherapy before surgical liver resection, were invited to participate in this study after written informed consent was obtained. The inclusion criteria were as follows: (I) patients with histologically confirmed metastatic colorectal cancer; II) patients aged 18 y or older; (III) patients with at least one metastasis larger than 1 cm; (IV) patients who agreed to take part in this study after informed consent; and (V) patients with no renal dysfunction and allergy to the contrast material. Nineteen patients fulfilled these criteria and were scanned (the day before surgery) from August 2013 to December 2014. 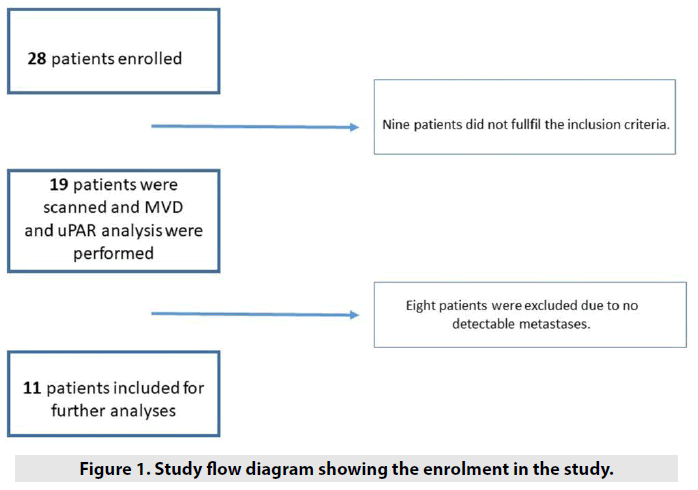 Eight patients were excluded due to no detectable metastases at the DCE-CT examination (the metastases were smaller than 1 cm but were seen on conventional CT images and by the surgeons), resulting in 11 patients (two women and nine men; mean age, 69 y; range, 46-84 y) were included for the analyses of DCE-CT values, uPAR and microvessel density (FIGURE 1). This study was approved by the Committees of Health Research Ethics in the Capital Region of Denmark ((H-1-2013-027) and the Danish Data Protection Agency (2007-58-0015). Figure 1: Study flow diagram showing the enrolment in the study. All of the examinations were performed using a 320-detector row CT scanner (Aquilion One, Toshiba Medical Systems, Otawara, Japan), which enabled rapid volumetric acquisitions over a range of 16 cm. This approach range made it possible to cover almost the entire liver with a single gantry rotation. A pump injector (Medrad Stellant © Bayer Healthcare, Leverkusen, Germany) was used to inject 50 mL of intravenous nonionic contrast medium (Omnipaque 350 © GE Healthcare, Milwaukee, WI, USA) and 50 mL saline through an 18-gauge catheter at a rate of 6 mL/s placed in an ante-cubital vein. The following CT parameters were used: 100 kV; 110 mA; 0.275 s gantry rotation time; 0.5 mm reconstructed slice thickness; matrix 512 × 512; and a volume scan image reconstruction with an adaptive iterative dose reduction 3D (AIDR 3D-standard) algorithm. The DCE-CT protocol consisted of 19 consecutive volumes divided into three sequences. The first sequence included nine volumes with an interval of two s, the second sequence contained six volumes with an interval of 3 s, and the third sequence encompassed four volumes with an interval of five seconds. The initial delay of the first sequence started 13 s after the contrast administration, and the total DCE-CT scanning time was 72 s. During the acquisition, an abdominal strap was placed around the abdomen of the patients to restrict the abdominal wall excursion, and the patients were also asked to breathe shallow to minimize the respiratory motion of the liver. The total dose-length product (DLP) of 19 volumes was 1,006.4 mGy* cm, which was equivalent to an effective dose of 15.1 mSv (k=0,015). Automated motion registration was applied using a non-rigid deformable registration technique for anatomic alignment of multiple scans using software (Body Registration ©; Toshiba Medical Systems, Otawara, Japan) [20,21]. Subsequently, the reconstructed, motion corrected datasets were transferred to a stand-alone workstation (Vitrea 6.3 ©, Vital Images, Toshiba Medical Systems, Otawara, Japan) for the DCE-CT analysis. Peak vascular enhancement was measured from a circular ROI within the abdominal aorta at the level of the hepatic hilus, a second ROI within the portal vein, a third ROI within the normal tissue of the liver, and a fourth ROI within the spleen. Regarding the ROI in the normal liver parenchyma, care was taken to exclude the large hepatic vessels and to include as much of the normal liver parenchyma as possible in at least 2 cm from the metastases. The time for the maximum enhancement of the spleen was used to separate the arterial and portal venous phases of hepatic enhancement . The DCECT values were then calculated using the dual input, maximum slope model encompassing measurements of the hepatic arterial flow (AF) (mL/min/100 g), portal venous perfusion (PF) (mL/min/100 g) and perfusion index (PI=AF/ (AF+PF)%) of the metastases. The DCE-CT values were measured for each metastasis, but for patients who had more than one liver metastasis, only the largest was used for the analysis. Freehand-drawn 2D ROIs (range 10-100 mm2) were placed at the tumour edge (12-3-6-9 o`clock positions), and care was taken to ensure that the ROIs were close to the tumour border but still within the tumour boundaries. The perfusion values in the metastases were calculated as the mean values for all the clock positions (FIGURE 2). For measuring the perfusion values in normal tissue, 2D ROIs of 600 mm2 were placed in three images with a distance of 3 mm. Furthermore, a 3D VOI, encompassing the entire volume of the metastases was established, as shown in FIGURE 3. We decided to compare the 2D ROIs in metastases with the 2D ROIs in the normal liver parenchyma, because it was not possible to avoid the vessels and malignant tissue using the 3D measurement in normal tissue. All the ROI and VOI measurements were performed by a trained observer. Figure 2: DCE-CT scans of a 74-year-old female patient with colorectal liver metastases. The perfusion values were measured by the 2D ROI method. The red circles represent the 2D ROIs in the metastasis. 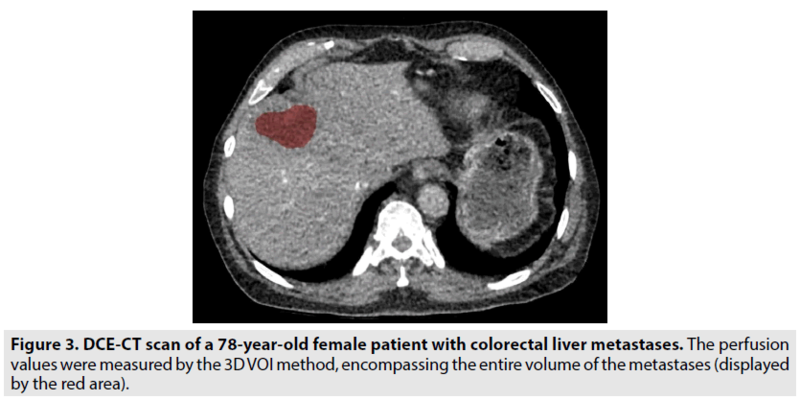 Figure 3: DCE-CT scan of a 78-year-old female patient with colorectal liver metastases. The perfusion values were measured by the 3D VOI method, encompassing the entire volume of the metastases (displayed by the red area). At the time of liver surgery, the removed metastases were marked in three dimensions, including the cranio-rostral, right-left and antero-posterior dimensions. The cranial part of the tissue was marked with a long thread, the right side was marked with a short thread, and the anterior part was marked with two short threads. In this way, it was possible to orient the metastasis according to the position in the liver, making it possible to perform histological analyses from the areas examined by DCE-CT. The tissue from the resected liver metastases was formalin-fixed and paraffin-embedded, and then 3 μm sections were cut. The sections were deparaffinized and rehydrated by a xylene- ethanol series. Afterwards, antibodies against CD31 and Ki67 were added for double immunostaining using the Envision G2 Doublestain System Kit (K5361, Dako) . The monoclonal antibody against Ki67 (clone MIB-1, Dako) was diluted to 0.92 µg/mL and was added first. The signal was developed with a diaminobenzidine chromogen. The second primary antibody against CD31 (clone JC70A, Dako) was diluted to 1.03 µg/mL and was visualized with Permanent Red. The slides were scanned in a Hamamatsu slide scanner (NanoZoomer 2.0-HT, Hamamatsu City, Japan) and were imported in the VisiomorphDP (Visiopharm, Hørsholm, Denmark) in order to be analysed using a vessel app . Five ROIs were drawn at the tumour periphery of every tissue slide, and the microvessel density value for each metastasis was an average of the micro vessel density values within five squares. Each square was 250 µm*250 µm=62.500 µm2=0.0625 mm2. If more than one metastasis was resected, the analysis was performed on the largest metastasis. The size of the histological analysed area was 5 × 0.0625 mm2 = 0.31 mm2, and the maximum size of the 2D ROIs from the DCECT scans was 100 mm2. Thus, the area of a ROI applied in the perfusion CT was approximately 300 times larger than the histological ‘window’. Blood samples were collected pre-operatively in 9 mL EDTA-coated tubes (Vacutainer Becton- Dickinson, Mountain View, CA, USA). Within 30 min, the tubes were centrifuged at 2,200 G for 10 min at 20-24ºC. The plasma samples were frozen within an hour after centrifugation and were stored at -80ºC until the analysis. Three different time-resolved fluorescence immunoassays (TR- FIAs) were used to measure the different uPAR forms in EDTA plasma, including TR-FIA 1 measuring intact uPAR (domains I-III), TR-FIA 2 measuring uPAR (domains I-III) + uPAR (domains II-III)  and TR-FIA 4 measuring the liberated domain I of uPAR (domain I). All three assays were validated for use in 20% EDTA plasma . All the samples were measured in duplicate, and the mean values were used for the statistical analyses. Nonparametric methods were used for the analysis, and all correlations were assessed using Spearman correlation coefficients. A two-tailed Wilcoxon rank sum test was used to test the observed differences in perfusion values between the metastases and normal tissue. A p-value less than 0.05 was considered statistically significant. This study was an explorative study where no previous results were available to perform a power calculation. DCE-CT values, microvessel density and uPAR were evaluated in 11 patients (two women and nine men; mean age, 69 y; range, 46-84 y) diagnosed with histologically proven colorectal liver metastases. TABLE 1 shows the mean DCE-CT values, histological parameters, and the mean plasma levels of the uPAR forms. Table 1. The numerical data for the DCE-CT parameters, histologic and plasma values. A statistically significant correlation was observed between the perfusion index value at the tumour periphery, as measured by 2D ROIs, and the microvessel density (r=0.75, p=0.01) as shown in TABLE 2. There were no other significant correlations between the microvessel density score and the other perfusion values. 1the measurements are a mean value for all the "clock positions". Table 2. Spearman rank correlation coefficient and p-values of the DCE-CT values (2D ROIs) and microvessel Density. None of the perfusion values (PI, AF, PF) measured by 3D VOIs were significantly correlated to any of the uPAR forms (Spearman Rank correlation coefficient (range: -0.61 ≤ r ≤ -0.01; p>0.98) as shown in TABLE 3. However, there was a statistically significant correlation (range: 0.72 ≤ r ≤ 0.89; p<0.0002) between all the uPAR forms and the volumes of the metastases measured by 3D VOIs (TABLE 4). Table 3. Spearman rank correlation coefficient and p-values of the DCE-CT values (3D VOIs) and uPAR forms. Table 4. Spearman rank correlation coefficient and p-values of the volume (cm3) of metastases (3D VOIs) and uPAR forms. The mean perfusion index value of the liver metastases (31.37%) was significantly higher than for the surrounding normal liver tissue (19.08%) (p=0.002) respectively. No significant difference was observed between the AF in the normal liver parenchyma and in the liver metastases. However, the PF in the normal liver tissue was significantly higher than that in liver metastases, p=0.001. The perfusion values for all 19 patients who received DCE-CT of the normal liver parenchyma are shown in the TABLE 5.1 and 5.2. Note: Values are given as mean values (2D ROIs), with 95% CIs in brackets. Table 5.1. DCE-CT mean-values (2D ROIs) for all the ‘scanned’ cases. Table 5.2. Perfusion values in the normal liver parenchyma for each case. In the present study, we examined the possible correlation among perfusion values and the microvessel density as well as between DCE-CT and the uPAR forms in plasma. Out of the three perfusion-values, we only found a statistically significant correlation between the perfusion index and the microvessel density values. The correlation between microvessel density and perfusion values, however, has been observed in two studies by Dighe et al. and Sun et al. . These studies included patients with primary colorectal cancer, all patients were examined with DCE-CT and the results showed no significant correlation between microvessel density and DCE-CT values of the primary tumour. However, the two mentioned studies differed from our study since the surgeons did not mark the metastases, making it more difficult to correlate the DCE-CT and histological findings. Furthermore, they used other protocols for performing the DCE-CT exams as well as different kinetic models for analysing the perfusion values. In our study, we did not detect any significant correlation between the DCE-CT perfusion values, as measured with the 3D VOI method, and the plasma uPAR forms, but the uPAR forms positively correlated to the size of the tumour. To our knowledge studies evaluating this correlation have not been described, although a number of studies shows that a high plasma uPAR value corresponds to a poor prognosis [18,19]. The perfusion values of the metastases and the normal surrounding liver parenchyma were significantly different. These findings are similar to the results of other studies that included patients with other cancers, such as liver metastases from neuroendocrine tumours [25,26]. Certain limitations of the current study should be noted mainly the small number of patients. In addition, although care was taken to match a corresponding section in CT and histology micro vessel density only assess a sub-millimetre area whereas the region of interest in DCE-CT is closer to 1 cm in diameter which may have impacted the results. In conclusion, we found that only the perfusion index in DCECT significantly correlated with the micro vessel density in surgically resected liver metastases. Larger studies are needed to further assess whether DCE-CT could be a potential noninvasive tool in the assessment of tumour vascularity. We thank Ruth Petersson for excellent technical assistance and John Post for graphical assistance. Thanks to the nurses Marianne Meldon at Department of Surgery, for being so helpful when recruiting patients. Thanks to colleagues at department of Pathology, department of clinical biochemistry and department of Radiology for a nice collaboration. Thanks to statistician Julie Lyng Forman for valuable collaboration. Kemeny N. Presurgical chemotherapy in patients being considered for liver resection. Oncologist. 12, 825-839, (2007). Siegel RL, Miller KD, Fedewa SA et al. Colorectal cancer statistics, 2017. CA. Cancer. J. Clin. 67, 177-193, (2017). Weidner N. Intratumor microvessel density as a prognostic factor in cancer. Am. J. Pathol. 147, 9-19, (1995). Rajaganeshan R, Prasad R, Guillou PJ et al. The influence of invasive growth pattern and microvessel density on prognosis in colorectal cancer and colorectal liver metastases. Br. J. Cancer. 96, 1112-1117, (2007). Eefsen RL, Engelholm L, Willemoe GL et al. Microvessel density and endothelial cell proliferation levels in colorectal liver metastases from patients given neo-adjuvant cytotoxic chemotherapy and bevacizumab. Int. J. Cancer. 138, 1777-1784, (2016). Dighe S, Blake H, Jeyadevan N et al. Perfusion CT vascular parameters do not correlate with immunohistochemically derived microvessel density count in colorectal tumors. Radiology. 268, 400-410, (2013). Grunnet M, Christensen IJ, Lassen U et al. Prognostic significance of circulating intact and cleaved forms of urokinase plasminogen activator receptor in inoperable chemotherapy treated cholangiocarcinoma patients. Clin. Biochem. 47, 599-604, (2014). Almasi CE, Hoyer-Hansen G, Christensen IJ et al. Prognostic significance of urokinase plasminogen activator receptor and its cleaved forms in blood from patients with non-small cell lung cancer. APMIS. 117, 755-761, (2009). Laerum OD, Ovrebo K, Skarstein A et al. Prognosis in adenocarcinomas of lower oesophagus, gastro-oesophageal junction and cardia evaluated by uPAR-immunohistochemistry. Int. J. Cancer. 131, 558-569, (2012). Uhrin P, Breuss JM. uPAR: a modulator of VEGF-induced angiogenesis. Cell. Adh. Migr. 7, 23-26, (2013). Rao JS, Gujrati M, Chetty C. Tumor-associated soluble uPAR-directed endothelial cell motility and tumor angiogenesis. Oncogenesis. 24, 53, (2013). Zhang L, Zhao ZS, Ru GQ et al. Correlative studies on uPA mRNA and uPAR mRNA expression with vascular endothelial growth factor, microvessel density, progression and survival time of patients with gastric cancer. World. J. Gastroenterol. 12, 3970-3976, (2006). Goetti R, Leschka S, Desbiolles L et al. Quantitative computed tomography liver perfusion imaging using dynamic spiral scanning with variable pitch: feasibility and initial results in patients with cancer metastases. Invest. Radiol. 45, 419-426, (2010). Eisenhauer EA, Therasse P, Bogaerts J et al. New response evaluation criteria in solid tumours: revised RECIST guideline (version 1.1). Eur. J. Cancer. 45, 228-247, (2009). Klotz E, Haberland U, Glatting G et al. Technical prerequisites and imaging protocols for CT perfusion imaging in oncology. Eur. J. Radiol. 84, 2359-2367, (2015). Luczynska E, Gasinska A, Blecharz P et al. Value of perfusion CT parameters, microvessl density and VEGF expression in differentiation of benign and malignant prostate tumours. Pol. J. Pathol. 65, 229-236, (2014). Goh V, Halligan S, Daley F et al. Colorectal tumor vascularity: quantitative assessment with multidetector CT--do tumor perfusion measurements reflect angiogenesis?. Radiology. 249, 510-517, (2008). Thurison T, Lomholt AF, Rasch MG, et al. A new assay for measurement of the liberated domain I of the urokinase receptor in plasma improves the prediction of survival in colorectal cancer. Clin. Chem. 56, 1636-1640, (2010). Lomholt AF, Christensen IJ, Hoyer-Hansen G et al. Prognostic value of intact and cleaved forms of the urokinase plasminogen activator receptor in a retrospective study of 518 colorectal cancer patients. Acta. Oncol. 49, 805-811, (2010). Piper J, Ikeda Y, Fujisawa Y et al. Objective evaluation of the correction by non-rigid registration of abdominal organ motion in low-dose 4D dynamic contrast-enhanced CT. Phys. Med. Biol. 57, 1701-1715, (2012). Crum WR, Hartkens T, FAU - Hill et al. Non-rigid image registration: theory and practice. Br. J. Radiol. 77, 140-53, (2004). Miles KA. Tumour angiogenesis and its relation to contrast enhancement on computed tomography: a review. Eur. J. Radiol. 30, 198-205, (1999). Piironen T, Laursen B, Pass J et al. Specific immunoassays for detection of intact and cleaved forms of the urokinase receptor. Clin. Chem. 50, 2059-2068, (2004). Sun H, Xu Y, Yang Q et al. Assessment of tumor grade and angiogenesis in colorectal cancer: whole-volume perfusion CT. Acad. Radiol. 21, 750-757, (2014). Ng CS, Hobbs BP, Wei W et al. Effect on perfusion values of sampling interval of computed tomographic perfusion acquisitions in neuroendocrine liver metastases and normal liver. J. Comput. Assist. Tomogr. 39, 373-382, (2015). Ng CS, Chandler AG, Wei W et al. Effect of dual vascular input functions on CT perfusion parameter values and reproducibility in liver tumors and normal liver. J. Comput. Assist. Tomogr. 36, 388-393, (2012).